The Andrea Carter Circle C books and Goldtown Adventures by Susan K. Marlow are wholesome reading with a Christian worldview for the entire family! My daughter devoured these books! Great, wholesome stories in a historic setting. Many of these titles include historical notes! 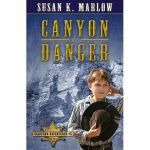 We've also included Susan's newest series, Goldtown Adventures, in this category!